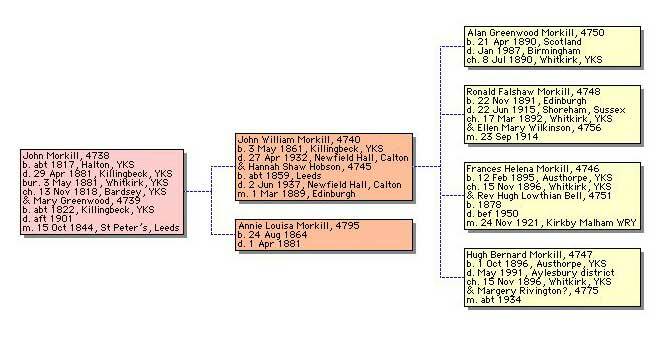 John William Morkill was the son of John Morkill of Killingbeck Lodge, Seacroft and Mary Greenwood. His father had intended a life in the church, remaining active in parish and diocesan affairs throughout his life, but due to his own father's financial problems, had joined a London merchants, later becoming a joint partner in a colliery company. John and Mary had two children, John William and Annie Louise, who died aged just 16 years. John William Morkill was born in 1861 and educated at Radley and Oriel College, Oxford, where he took a law degree and also gained an MA. He married Hannah Shaw Hobson the youngest daughter of Peter Hobson of Castle Lodge, at Edinburgh in 1889 and they had four children. Their first sons; Alan Greenwood and Ronald Falshaw were born in Scotland. 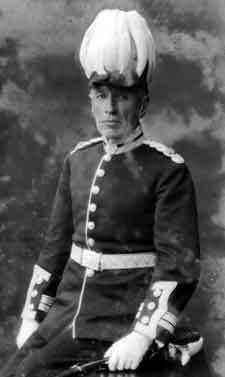 After service in World War I, Alan went on to join the Colonial Service. After being invalided out of the Malayan Civil Service he returned to London and read for the Bar and became a barrister. He was called up for the Officer's Reserve in 1939 and served in the judge Advocates department of the RAF in Canada and England. After the war he worked in Chinese affairs and was an advisor to the Colonial Office on the education of Malayan students. When he inherited Newfield Hall the heavy death duties and other financial problems caused the breakup of the estate. Some farms were sold to tenants, the hall was let to the Holiday Fellowship and the remainder of the estate sold to All Souls College, Oxford. His brother Ronald became a Lieutenant in the West Yorkshire Regiment and flew in the Royal Flying Corps, dying in a flying accident in 1915. He is buried in Kirkby Malham churchyard, the only grave maintained there by the Commonwealth War Graves Commission and is commemorated in one of the stained glass windows. Their two younger children Frances Helena and Hugh Bernard, were both born after John William and Hannah moved back to the Leeds area. Frances married the Rev Hugh Lowthian Bell, the son of Sir Thomas Hugh Bell, at St Michael the Archangel, Kirkby Malham and they went to live in South Africa. Tragically Hugh died of typhoid just before the birth of their second child. His elder son Hugh inherited the Bell estates and baronetcy, but his younger brother died on HMS Warwick. Hugh Bernard was also educated at Radley and a keen sportsman. He was commissioned into the Green Howards in 1915, seconded immediately into the Royal Flying Corps and got his wings in the RAF, rejoining the Green Howards in 1922. In World War II he commanded a battalion of the Durham Light Infantry. He married Marjorie Rivington in 1934 and had three children; Tom, Sarah and David. Tom and David were both at Radley and between them produced five daughters but no sons, so it seems the Morkill name associated with this part of the family is destined to end. After the family moved back to Yorkshire from Scotland they lived at Austhorpe Lodge, Whitkirk and John William, who was very interested in heraldry and local history, transcribed the Records of the Parish of Whitkirk, the home of his family for several generations, and also published The Manor of Roundhay. 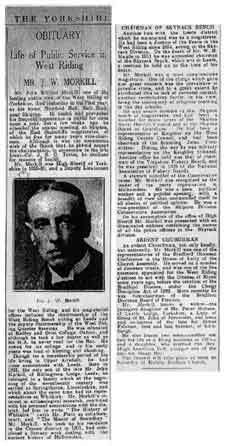 In 1894 John William Morkill became a Justice of the Peace for the Skyrack Division of the West Riding, later becoming assistant chairman, then in 1911, chairman of the Skyrack Bench, a position he held until he died. He also held a number of other public appointments including being a senior member of the Skipton Bench; a Skipton Rural District Councillor; member of the Skipton Board of Guardians, and chairman of the Yorkshire Fishery Board. He was also a keen political worker, being the vice chairman of Skipton Conservative Association and a County Councillor for Keighley. In 1901 he bought Newfield Hall, previously occupied by William Illingworth of the Bradford textile family and with it, the title of Lord of the Manors of Airton, Calton and Hanlith. He became a director of the Craven Bank and was the High Sheriff of Yorkshire in 1929 and Deputy Lieutenant of the West Riding. He still found time to pursue his history interests, researching his family tree and compiling the Descent of Morkill, of Austhorpe and Newfield Hall, in the West Riding of the County of York in 1915. Like his father he was an active churchman, supporting the local church wherever he lived and more widely as a representative of the Bradford Diocesan Conference and Vice Chairman of the Bradford Diocesan Finance Board. Whilst living at Newfield Hall he also pursued his academic interests and accumulated a large amount of local history material about Malhamdale. During a long illness he ordered his collection of information and compiled this book before he died in 1932. His wife ensured it was published after his death leaving us an unique collection of information about the Dale. Although time has revealed a few minor errors, it has remained the definitive work on the local history of Kirkby Malhamdale and is an extremely sound and well researched work which is due to be republished in aid of Kirkby Malham Parish Church. Also check this family history website where you can find more information on the Morkill family genealogy .